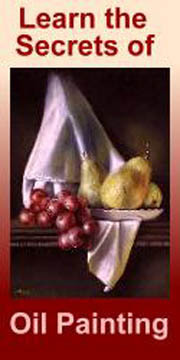 Read E-Book Reviews of Some of the Best Books for Hobby Artists. Impartial E-book Reviews - Best E-books, Videos or DVDs. Hopefully, honest e-book reviews will be based on an assessment of their overall value to prospective readers. Be aware, though, that quite often the review writer may be paid a small commission should a sale of the book result so their review could err on the side of over-enthusiasm! Writing reviews is a responsibility that should not be taken lightly. You will probably be skeptical of ‘rave’ reviews that don’t bring a sense of balance to the investigation and appear to be sales pitches. So I only review books that I have read and considered from the viewpoint of prospective students. Even then, I will not write e-book reviews if I don’t feel that the book is of much value. The ‘e’ stands for electronic, so an e-book or video is transmitted over the internet and can be instantly downloaded and read on the screen of your computer, ipad or other e-book reader. Many people choose to print out their newly purchased e-book for easy reference or copying of exercises and diagrams. Payment for the book may also be made electronically using credit cards or other arrangements. If you are worried about security choose sites that start with ‘https’ – the extra ‘s’ meaning that they are particularly secure. Reputable payment systems include Click Bank and Paypal. Most e-books, videos and DVDs carry a warranty and have a ’no questions asked’ refund policy should you be dissatisfied with your purchase for any reason. It has become common practice for authors to offer free e-books relating to the subject of the book as a bonus to purchasers. Sometimes the extra book or books will have been written by the same author, at other times by a different writer with similar interests and skills. They usually complement the purchased book in some way. As well as bonuses some e-book authors will encourage you to read a sample of a section of the book – perhaps a chapter or the introduction. This is useful to you as it shows the author’s style and you will be able to get a sense of how well informed and experienced they really are. 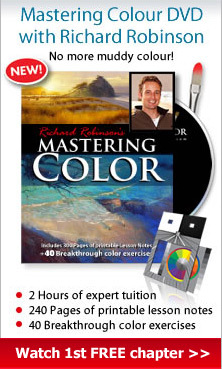 Books and videos about how to paint, draw, sculpt, photograph and so on are usually written by an artist or else about an artist and their working methods by an interested and understanding author/publisher. This is a valid arrangement as visual artists are not always interested in or capable of making videos or teaching others through their writing. Although e-books about aspects of making art are interesting and informative they are, in my opinion, no substitute for an accredited tertiary art course. Their usefulness seems to be as an adjunct to other studies, to assist with a hobby or as a substitute for ‘hands on’ instruction in a classroom situation if you live distant from such facilities or are unable to travel for some reason. Please remember that we ‘learn by doing’ so you will need to practice your new skills if you wish to become proficient at them. Please click on each image for more information about the book and its author. 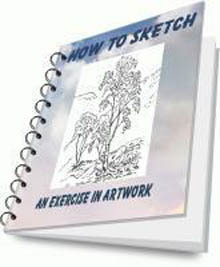 This ebook, also now in hard copy, takes you by the hand and leads you down the delightful path of discovering how to make your own sketches of everyday objects, scenery, animals and people. It is highly suitable for beginners - enjoy! Richard Robinson is just so good at what he does; from painting demonstrations using oils or acrylics to helping you to draw and paint with proficiency and enjoyment, his friendly personality makes it all seem effortless! Sarah Parks seems rather reserved to me but her quiet delivery and thoughtful planning is so well organised and covers all basic aspects of learning to draw that I rate her course as one of the best that I have found. And, after all, how can you expect to be able to paint intelligently unless you can draw? And now I am about to contradict myself! This very interesting and detailed explanation of how to paint as the Flemish masters did, hardly uses any drawing skills at all! You will be fascinated by how you can produce a painting using the craftsmanship and painting tips from hundreds of years ago! ART TUTOR VIDEOS - choose from hundreds! Such a choice awaits you when you enrol in the highly structured Art Tutor video courses and demonstrations, with new lessons and tips being added regularly. 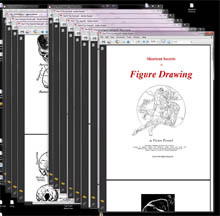 Learn human figure drawing by understanding and practising the anatomy of muscles, ligaments and bones from this old book by Victor Petard, converted to digital format by Ethan Smith.